oh, sweet joy! : it's time. Recently, I took a trip to Texas to get away and think, pray, and seek the Lord's will in several matters that were on my heart. I know myself well, but often times I try to hide the ugly, the selfish motives, and cover it up with excuses. My prayer for my few days away was that the Lord would give me clear direction about how I spend my time. ((being a wife, work, teaching sewing lessons on the side, discipling, serving in different capacities at The Well, living in community, this blog, my shop, etc.)) I felt overwhelmed, spread too thin, and unsure that what I was seeking and expending my energy on was even what God had for me. As I prayed and pondered and took some time to just sit and be with the Lord, I felt confident that anything that isn't missional and intentional needed to go. Things that had become burdens that I put on myself can't be a priority any longer. When I read this verse, I felt sick at my stomach...not from guilt but of conviction. A conviction I couldn't shake. I've seen so much ugly in my heart when I try to become well known, gain more followers, yearn for sales, and find my worth in it when that happens. My worth and identity HAS to come from the Lord and not my selfish motives or desires or my shop or my follower count or my paypal account balance. With all of this said, I will be closing the doors of my online shop. When I receive orders, they have become a burden. Trying to find time to sit at my sewing machine to sew dresses or burn myself with use my glue gun for some rosettes is tough when my schedule is so hectic and constantly full. I find so much more joy in being generous with my designs, allowing you guys to follow along to a tutorial. Handmade Monday will be jam packed with some fun tutorials that I've tried to hold off on because I was considering selling those designs. Money had become a desire my heart was resting in, not a bonus from doing what I love. I will also hopefully be working towards making this whole India thing a reality...which is another post for another day. Long story short: a non-profit partnership will possibly be coming to fruition sooner than later where we will be employing & outsourcing my sewing to unemployed Indian widows in need of income. They will earn a fair wage and I will have more sanity & possibly not go blind from late nights sewing hundreds of coffee cuffs and bridesmaid dresses. SO... in the next few days you will have a chance to purchase some of my inventory that I've had saved up for miscellaneous craft shows, gifts, etc. They are being sold at killer prices that kind of stings, but there is so much peace in getting it all out of my closet. Just like those furniture store commercials - everything must go, my friends! Shop the Oh, Sweet Joy! store closing sale HERE. You are amazing. Thank you for sharing this- I know that I needed the reminder!!! Listening to what God wants for your life can be the scariest thing - it's how my friend ended up doing YWAM in South Africa (We're in the UK!). Another friend of mine has been chef-ing since he was 16 – he turned 27 in February and last summer felt that he needed to give up chef-ing and go all out for God – he quit his job and with some support from his parents he did a gap year at his church – he’s nearly finished his gap year – I don’t know what he’s up to next but I know he’ll be listening to God’s voice and going that way. We were talking about something during the Madrid vs. Bayern Munich match last night and got onto the subject of Amsterdam. (It started with a stereotypical close minded opinion) then I got thinking what about doing a short term mission with YWAM at their base in Amsterdam – it’s right in the city and would be the most amazing experience ever (I went to Amsterdam for the first time 5 years ago). I'm sad to see your shop close, but glad you decided to go ahead and stop what doesn't make you happy anymore! I kind of need the courage to do the same too. There's no point in life doing what doesn't work for us anymore! Wow, Kim! This decision certainly takes a lot of guts & even more faith. May the Lord bless you! I did the same thing a little over a year ago, and it was the best decision I could have made. I, unintentionally took a WHOLE YEAR off from blogging after I closed my shop... oops! Sewing had become a chore and not a source of joy. I resented doing what I used to love! Awe, how bittersweet. It's hard to learn we can't do it all. I'm excited to hear your blogging journey will continue though! and encouraged by how much you loved your "day job" and are building community in Boulder (a place much like where we are in its spiritual climate)! I'm honored to be an upcoming sponsor with someone who is really listening to the Lord and living His will. You have touched my heart to really seek out if all the activities in my life right now are part of His plan. Good for you! So proud of you. God was reminding me yesterday where my worth comes from. Congratulations! awww how bittersweet, kim! but i TOTALLY know where you are coming from! once i got pregnant, i knew i wouldn't be able to sustain a full time job, blogging, baby, family, AND an etsy shop! you know what is best for you!!! and your handmade mondays are awesome!! your heart for the intentional and missional is super encouraging, and I can't wait to hear more about your collaboration with Indian women- that sounds amazing. I've only just discovered you and now your store will close! I'm blessed by your post, however; this is something I've been praying over. 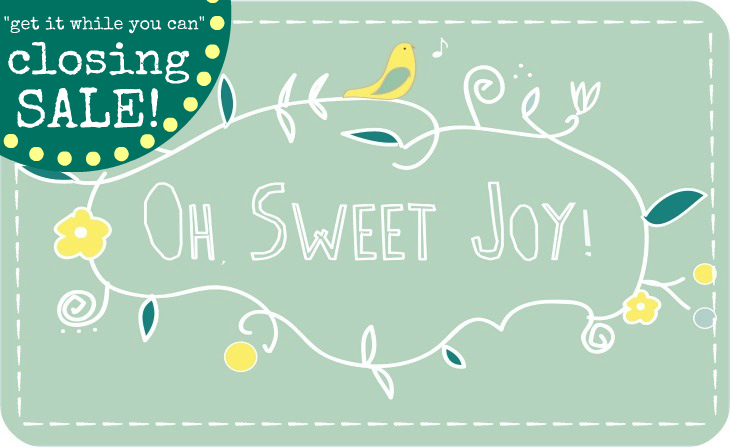 Thank you for sharing, and I'll still be delighted to see Oh Sweet Joy tweets in my feed :) God's best to you Kim! I'm going to miss your shop but am so excited to see what awesome things God has in store for you now that you have more time to focus on what He wants you to do next! Love you! thanks for sharing your heart Kim! so glad to hear you took time to be still and listen and are acting on what you heard. I think it's time for me to do the same. you are wonderful! How refreshing to see this. This brings me right back where I am supposed to be in the Lord as well. I'm so glad I read this, thank you for posting your heart in this!! i understand, oh how i understand. respect you fully, dear! my etsy is on an indefinite break. Just as you and Gussy had inspired me to start up a shop to sell my baby quilts/blankets, I find out your shop is closing! Oh dear! But if it's where the Lord has lead you, then it MUST be the best thing that could happen because "All things work for good for those who love the Lord and are called according to His purpose"! And (as my grandmother would say) you are surely called!